On the way from London to Barcelona I had to connect in Munich. 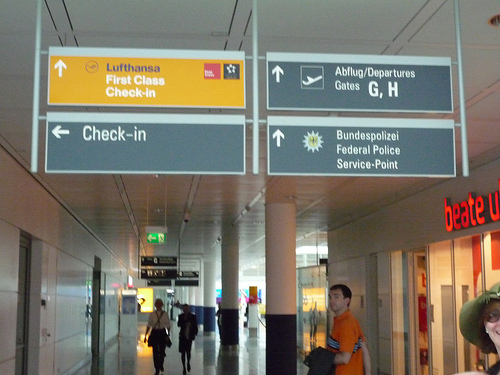 This was my first time to visit the Munich Airport. Once on the ground I headed directly to the Senator Lounge. I wanted to get a little bit to eat and a beer — and of course to take a look around. I was greeted by a very stern Lufthansa employee who didn’t say a word as she reviewed my documents. I tried to head into the First Class Lounge, but my stern Lufthansa greeter quickly redirected me. Damn. The Senator Lounge was pretty full, but I found a seat without a problem. 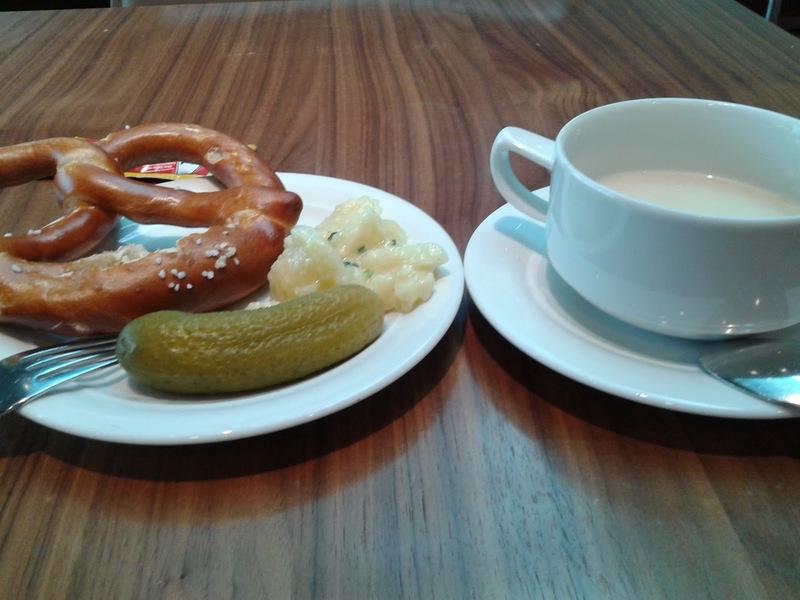 I started off by filling a plate with traditional German food – a Spicy Pickled Cucumber, Celery Soup and a Pretzel. I thought there would be more food out, I was a little disappointed. I sat down and ate my little snack. I picked up a couple of magazines (in German and English — couldn’t find a French one though). As I was heading out of the lounge I found another area with hot food, which included a potato dish, some cheese tortellini and some grey/brown meat — all which looked substantially better than the pickle & pretzel I had earlier. I grabbed a plate and wolfed down another snack. Honestly, the grey/brown meat and the tortellini were really great. I head off to my gate, which was in Terminal G. I landed in Terminal H. I followed the signs and got lost. I turned around, followed the signs again to G…and got lost. I turned around…yes, you guessed it. I got lost. Three times I got lost and couldn’t find the exit into G. I guess the 4th time is the charm for me. I still got lost 3 times. I schlepped all the way to the very far end of Terminal H, by 2-3 smoking booths and found myself at Gate 46 for my flight to Barcelona. This area of the airport was uncomfortably hot — probably 7-10C warmer than the rest of the airport. I had to wait less than 5 minutes from the time I arrived at the gate until we started to board. Good thing I had a second plate of snacks at the Lounge, otherwise I would have had to wait for 15 minutes…god forbid! I then boarded and was off to Barcelona. What do you think of the Munich Airport? Do you find the Lufthansa Lounges to be a relaxing place to kill some time at the airport? How about that tortellini, eh? Have you ever managed to sneak into the First Class lounge instead of the Senator Lounge? By Tim in Travel on October 11, 2012 .